Enjoy a commanding view of the city from the Observation Floor on the 89th storey of Taipei 101, Taipeiโ€�s most famous landmark. Shopping opportunities abound: Well-heeled fashionistas will be attracted to the upscale boutiques and flagship stores at Taipei 101 Shopping Mall while the affordable price tags of chic fashion stores in Ximending are particularly popular with the younger crowd. Shilin Night Market is the largest in Taipei and fits in perfectly with the late-night lifestyle of the Taiwanese. The maze of street-vendors offer an astonishing variety of products like hip fashion, toys, sports attire in addition to mouth-watering local snacks. Explore the rich heritage of Chinese civilization at the National Place Museum, relax and unwind at the hot springs at Beitou, or be mesmerized by the beauty of lush greenery in Yangmingshan National Park. Book your Taipei hotel and be spoilt for choice on how to spend your day. opened-spaced park is in 5 minutes walking distance, steps from MRT ZhongShan Station (10-15 mins by walk) where can reach retails stores, duty free shop and fashion boutiques. The Empress hotels is located in the city centre of Taipei with only 5 minutes walk to the city MRT Yuan Shan station and the Taipei Fine Arts Museum in walking distance. Close access to the most indulge and celebrate shopping and entertain "Hsin-Men-Ding" recreation centre, hip trendy youngster fashion well blended with memories of baby boomer. Restaurants, shopping complex, fantastic stores, movie theatre all within hotel's doorway. Hotel Grand is located in Yuan Shan Mountain which about 1 km to Taipei businsess centre. It's about 50 minutes from TaoYuan International Airport and is a 15 minute walk to MRT station and the most famous "Shi-Lin" night market. Situated in heart of Taipei city's west bound commercial district, it is just a 5 minutes walk from MRT Zhongshan station and 10 minutes away from Taipei Railway Station, 45 minutes away from TaoYuan International Airport. Hotel Seasons is located at a quiet place near downtown, neighboring the century-old Dihua Street where is a tradition trading area of ancient Taipei city which is famous for imported goods, garment and cloth market, Chinese herbal street. Hotel Brother is located right in the heart of Taipei's commercial district. Surrounded by convenient public transport links with a Metro station and bus stop located just outside the hotel. Hotel is also located near banks,Department stores and cinemas. The Landis hotel is located in the business district only 45 minutes away from the TaoYuan International Airport and 10 minutes to the Taipei Railway Station, high speed railway and MRT stations. The Gala hotel is located in the downtown business center of Taipei, 15 minutes drive from the train station and 40 minutes drive from the TaoYuan International airport. There is easy access to the freeway and tourist attractions, with all shopping areas within 10 minutes drive. The Les Suite is located in the heart of Taipei city downtown, 5 minutes to Mass Rapid Transit (MRT) Chung Hsiao Fu Shing station or Chung Hsiao Dun Hua station. Walking distance from the most prestigious shopping, entertainment and business districts. 10 minutes away from TWTC Exhibition Hall. The Ambience hotel is located in the heart of Taipei's business and financial district, within 10 minutes' walking distance to the mono-rail station. 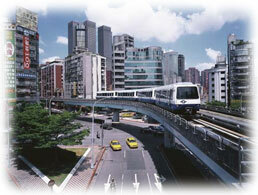 It is 35 minutes from the TaoYuan International Airport and is only 2 kilometres from the railway station.